“Fix my kid.” This is the desperate cry of parents and caregivers who walk into your office seeking help. You start the therapeutic process with your go-to techniques. And your client progresses … for a while. But when they fail to make additional gains, or even regress, your skills as a therapist are put to the test. When all your usual tools have been exhausted, you’re left feeling helpless and wondering how to move forward. Breathe new life into therapeutic approaches for resistant and avoidant cases with creative, activity-based interventions grounded in the proven success of CBT! Amanda Crowder, LCSW, delivers an energetic, technique-heavy workshop that will give you the tools you need to harness the power of a creative, activity-based CBT approach. Amanda will provide the exercises and interventions she’s found most effective in improving outcomes for children and adolescents with disruptive behavior, trauma, ADHD, defiance, anger, anxiety, depression and family conflict. Case examples, activities and hands-on practice will enable you to easily integrate these essential skills in your practice and allow you to individualize them for a variety of disorders and temperaments. Evidence-based techniques help you to drastically increase children’s engagement in treatment, improve emotional functioning, strengthen relationships, maximize academic engagement, and minimize acting-out behaviors. Must-have strategies create an affiliation between you, the child, and family members – boosting parent/child satisfaction, motivation and retention in therapy. During this essential recording, Amanda will help you feel prepared and empowered to improve the lives of your most difficult-to-treat young clients with a creative, activity-based CBT approach! Formulate strategies to develop a therapeutic alliance that engage children and adolescents in easy, creative and effective therapeutic cognitive behavioral activities. Apply, practice, and integrate evidence-based CBT techniques to modify and change maladaptive behaviors. Assess, challenge and replace negative self-talk, thoughts, assumptions and core beliefs. Practice fun and creative emotional regulation activities that help children & adolescents strengthen their emotional language, thus reducing dysregulation. Communicate the importance of collaboration with families and utilize approaches to engage families in the treatment of children and adolescents. Utilize the CBT thought record and mood charting in order to enhance data-based decision making. 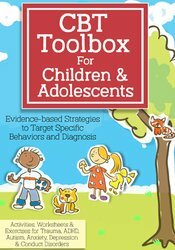 Amanda Crowder, LCSW, is co-author of the best-selling book CBT Toolbox for Children and Adolescents: Over 200 Worksheets & Exercises for Trauma, ADHD, Autism, Anxiety, Depression & Conduct Disorders (PESI, 2017). Amanda is an expert at moving evidence-based interventions into practical methods for application and moving research into action. She has created and adapted evidence-based interventions to work with the most challenging children, adolescents, and families in the most difficult situations. By helping to establish the Trauma Informed Care Initiative within Carolinas Medical Center, Amanda has proven her leadership in moving clinical concepts into practice. Amanda runs a private practice in Charlotte, NC, and continues to work for Carolinas Medical Center within a crisis center and virtual mental health emergency room. Her specialties include depression, anxiety, trauma, behavioral issues, and family issues. Amanda uses realness, humor and passion to build rapport with clients and audiences. Financial: Amanda Crowder is in private practice. She receives a speaking honorarium from PESI, Inc.
Nonfinancial: Amanda Crowder has no relevant nonfinancial relationship to disclose. This course consists of 6.0 self-study clock hours. Credit requirements and approvals vary per state board regulations. Please save the course outline, the certificate of completion you receive from this self-study activity and contact your state board or organization to determine specific filing requirements. New York Educators: PESI, Inc. is an approved sponsor of CTLE with the New York State Education Department's (NYSED) Office of Teaching Initiatives. Provider #23567. This self-study activity will qualify for 6.0 Approved Continuing Teacher and Leader Education (CTLE) Hour(s), in the area of Pedagogy. Hours are based on full attendance. Board required certificates will be sent after the program. PESI, Inc. is an AOTA Approved Provider of continuing education. Provider #: 3322. This self-study course qualifies for 6.0 self-study contact hours or .6 CEUs in the Category of Domain of OT and Occupational Therapy Process. The assignment of AOTA CEUs does not imply endorsement of specific course content, products, or clinical procedures by AOTA. Course Level: Intermediate. Expires: 12/7/2020. This self-study activity consists of 6.0 clock hours of continuing education instruction. Credit requirements and approvals vary per state board regulations. Please save the course outline and the certificate of completion you receive from this self-study activity. Contact us for more information on your state board or organization specific filing requirements. American Psychological Association credits are not available. This course is offered for 0.55 ASHA CEUs (Intermediate level, Professional area). **ASHA CEUs are available on this course from 01/01/2019 to 12/31/2023. PESI, Inc. will submit ASHA CEU Requests to the ASHA CE Registry on a monthly basis; ASHA CEU Requests received before 01/01/2019 or after 12/31/2023 cannot be reported. Kansas Speech-Language Pathologists: Approved for 7.0 self-study continuing education clock hours for Kansas licensed Speech-Language Pathologists by the Kansas Department for Aging and Disability Services. Pennsylvania Social Workers/Counselors/Marriage & Family Therapists: This intermediate activity consists of 6.0 clock hours of continuing education instruction. Credit requirements and approvals vary per state board regulations. Please contact your licensing board to determine if they accept programs or providers approved by other national or state licensing boards. A certificate of attendance will be awarded at the end of the program to participants who are in full attendance and who complete the program evaluation. Full attendance is required, variable credits may not be awarded per the Pennsylvania State Board.